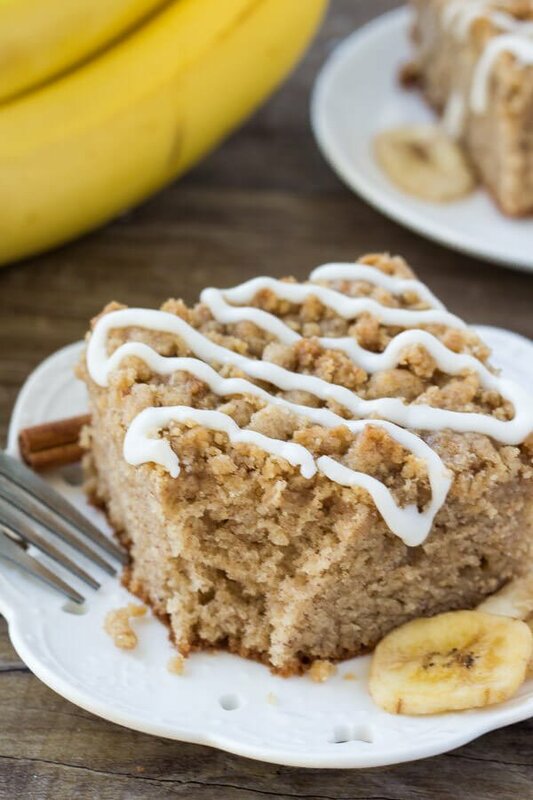 Instead of making banana bread – try this banana coffee cake. It’s a deliciously moist banana cake filled with cinnamon, brown sugar and vanilla. Then it’s topped with crunchy cinnamon streusel and a drizzle of vanilla glaze. Banana bread is high up on my list of favorite things to bake. It’s deliciously dense, perfectly moist, filled with warm & cozy flavors, and is absolutely delicious for breakfast or a mid-afternoon snack. But just like any classic recipe, sometimes a little switch-up is exactly what the doctor called for. And that’s where today’s banana coffee cake recipe comes in. I had been watching a bunch of bananas on my countertop slowly turn from yellow to brown – and I knew it was time to get baking. I could have made regular banana bread, but for whatever reason I was feeling particularly inspired and wanted to make something a little different. So – banana coffee cake it was. 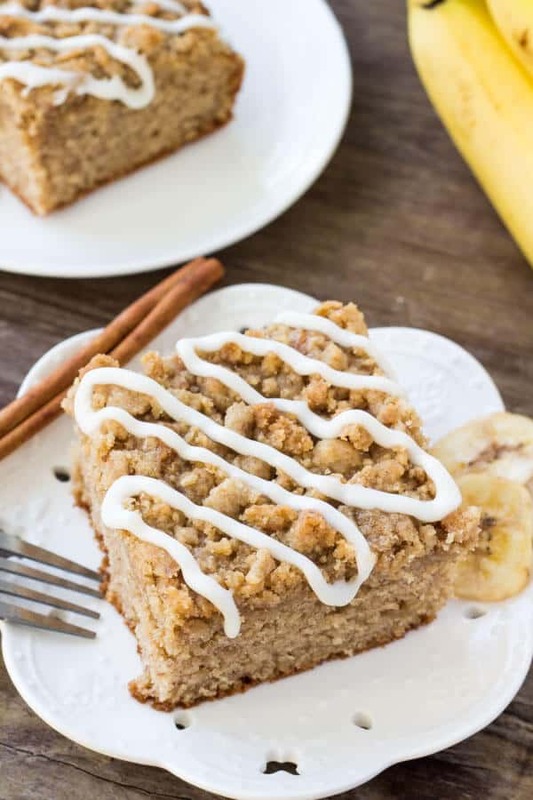 It’s a deliciously moist banana cake that’s filled with warm brown sugar and a hint of cinnamon. Then it’s topped with crunchy streusel topping and a drizzle of icing. 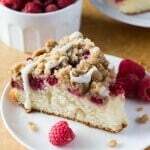 It’s perfect for breakfast or brunch – or really anytime that you want a warm & cozy slice of cake. 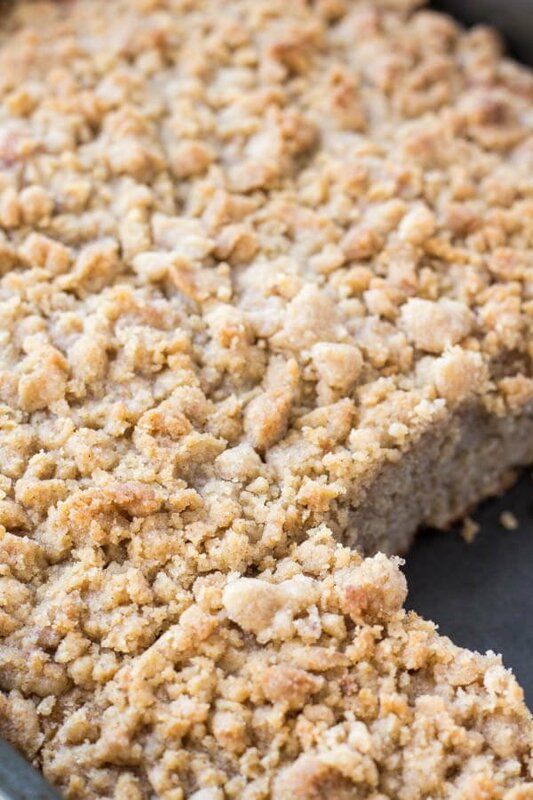 To make the cake – first we’ll make the streusel. We’ll mix together flour, white sugar, brown sugar and cinnamon – then stir in the melted butter. The consistency will be like wet sand, and form crumble if you squeeze it between your fist. Then it’s time to make the cake. Start by creaming together the butter and sugars. Real butter = more flavor/buttery goodness. Then adding brown sugar adds the most delicious caramel undertone. I almost always use at least some brown sugar in recipes when baking because it keeps things moist and adds flavor. Then we mix in the mashed banans (make sure they’re good and brown for more flavor and to make the cake extra moist). Then the flour, leaveners, cinnamon & salt are then mixed in, followed by the sour cream. To make sure the cake is deliciously tender with a soft crumb, make sure not to over mix your batter. Otherwise, it can get tough. The batter will be thick – which is exactly how you want it. Then pour the batter into the prepared pan, and crumble the streusel overtop. 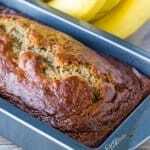 As the banana coffee cake is baking your kitchen will fill with the most delicious cinnamon banana aroma. Then after it’s done baking and cooled, I drizzled each piece with a little vanilla glaze/icing. It adds a little extra sweetness, and a little pop for visual appeal. Jay brought this cake to work – and it turns out there was none left by lunchtime. So I think it’s fair to say that it was a hit. Because you can’t go wrong with moist banana cake and crunchy cinnamon streusel. 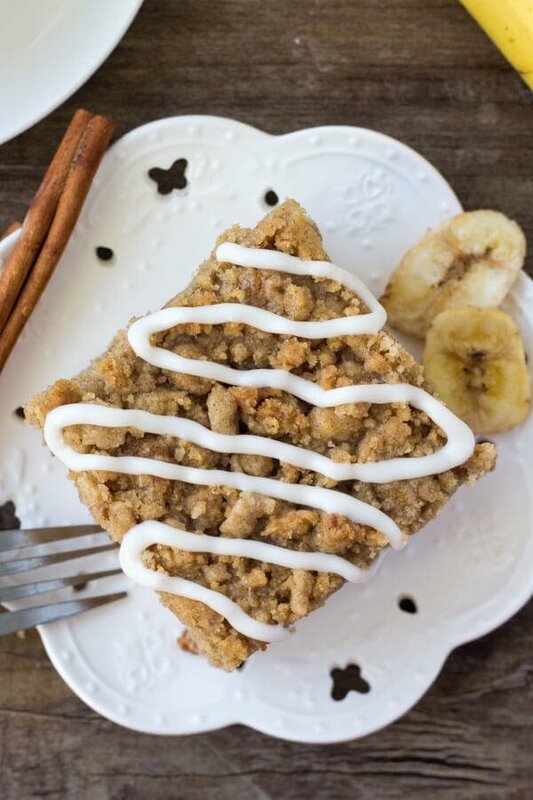 Instead of making banana bread - try this banana coffee cake. It's a deliciously moist banana cake filled with cinnamon, brown sugar and vanilla. 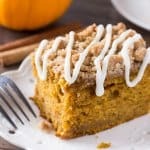 Then it's topped with crunchy cinnamon streusel and a drizzle of vanilla glaze. In a medium bowl stir together the flour, brown sugar, granulated sugar and cinnamon. Stir in the melted butter. The consistency will be like damp sand. Grease and lightly flour a 9x13 inch baking pan. In a large bowl beat together the butter and sugars until fluffy. Then beat in the eggs and vanilla extract. With the mixer on low speed, mix in the mashed banana. Carefully mix in the flour, baking powder, baking soda, salt and cinnamon. Pour the batter into the prepared pan. Then crumble the streusel overtop. Bake for 35-45 minutes or until an inserted toothpick comes out clean and if you give the pan a nudge the cake doesn't wobble in the middle. In a medium bowl whisk together the cream/milk and powdered sugar, adding a little extra liquid or powdered sugar as necessary. Cut the cake into slices and drizzle the top of each cake with glaze. *Leftovers can be covered tightly and stored at room temperature for 3 days or in the fridge for 5 days.